【90% Less Energy Use】: SNAP-DIRECT light bulb led provides 2900 lumen of deluxe daylight, equivalent to 200-watt incandescent with 90% less energy use. 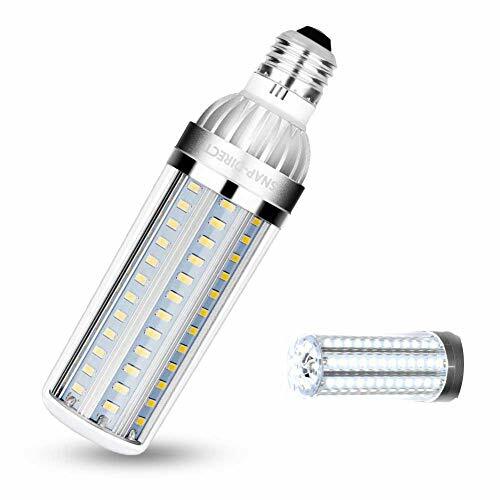 These corn cob bulbs fit standard medium base (E26) fixtures and an extra bright atmosphere. 【Cool Energizing Bright Light】: 6500-Kelvin, these deluxe corn light bulb offer cool and bright lighting with high CRI (color rendering index) to deliver bright, crisp color ideal for whole room ambient light as well as in area lamps. 【60% Longer Lifespan】: Special built-in cooling fan, enhance the ventilation and heat dispersion of the corn LED bulb, increase more than 60% services life. The upgrade light bulb led up to 50,000 hours\' lifespan. 【Easy Installation】: This patio light bulbs is about the same size as a 200ml soda bottle, its easier to install compared to compact fluorescent or large corn cob bulb, is easier to grasp while turning to install the bulb. 【Superior Quality】: These high-value led bulbs daylight offer durable, shatter-free plastic construction. SNAP DIRECT LED Bulb turn on instantly with energy-efficient flicker-free, natural light that won\'t degrade over time. If there\'s any quality problem occurs within 2 years, we will replace with new product and send to you for free.